Do you trust who you are in relationship with? Now, the answer seems pretty obvious if you are in a relationship with someone, but is it?The truth is that you can be in a relationship with someone for years but not truly trust them–not be open to them. We’ll give you an example of how not healing an old wound can cause trust issues to come between you and show you the benefits if you do. In the beginning of our relationship, Otto started writing about marketing ideas. Because Susie is a much better editor than he is, he would ask for her help. Each time she gave some suggestions, he became very defensive and it would take some time for him to get past the “trust” issue of feeling criticized unfairly. He found that he viewed the criticism of his work as an “attack” because of past experiences with other people in his life instead of understanding that Susie was just trying to make the project better. In that moment, he didn’t trust that Susie was “on his side.” While he “understood” mentally that she was trying to make his book better, there were emotions that he hadn’t been able to acknowledge that wouldn’t allow him to “trust” the process. Even though we have felt like we were soulmates from the beginning of our relationship, like most couples, there are challenges that have come up between us, many left over from past relationships. This was one of them. Some people believe that when you enter into new relationships, you are starting fresh and you leave all of that baggage from previous relationships behind you. You always hope that’s the case, but the truth is, you don’t always heal everything from past relationships when you move on. We believe that in that new relationship, or even an old one, there’s always another opportunity to heal those parts of ourselves that end up causing us problems. A few months after the first marketing book came out, we got a chance to do it differently. Otto was once again writing another marketing book and Susie was the editor. But this time, we noticed a difference in Otto’s reaction to Susie’s suggestions for how to make the book better. When she made her suggestions, he still had an initial reaction but this time, he didn’t take the criticism personally. He trusted and felt that Susie just wanted to help him to make the book better. What had changed? Otto was willing to feel his emotions in the moment and then direct his attention to honoring Susie’s gifts and talents. He was willing to change his habitual behavior and come from a place of love and not fear. This is a beautiful example of healing the past and the deepening of trust in our relationship. 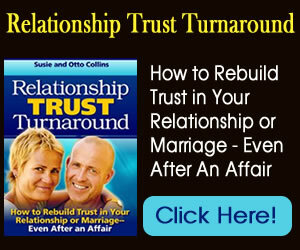 We believe that the foundation of any relationship is emotional safety and trust. This means that physical safety is a given and you feel emotionally safe enough to be who you really are and be able to express yourself freely. Most people want to place the responsibility for trust in a relationship on someone else. They base their trust on how someone acts towards them. We’ve discovered that trust in a relationship doesn’t start with someone else. It starts with you and how willing you are to open up and allow the other person in. If you’re having trust issues in a relationship, we suggest examining your own thoughts, feelings and issues from the past that have yet to be healed first before looking outward to blame someone else. We also suggest taking a step forward into love instead of fear every chance you get.